Like most of you, I am highly dubious of “diet candy”. 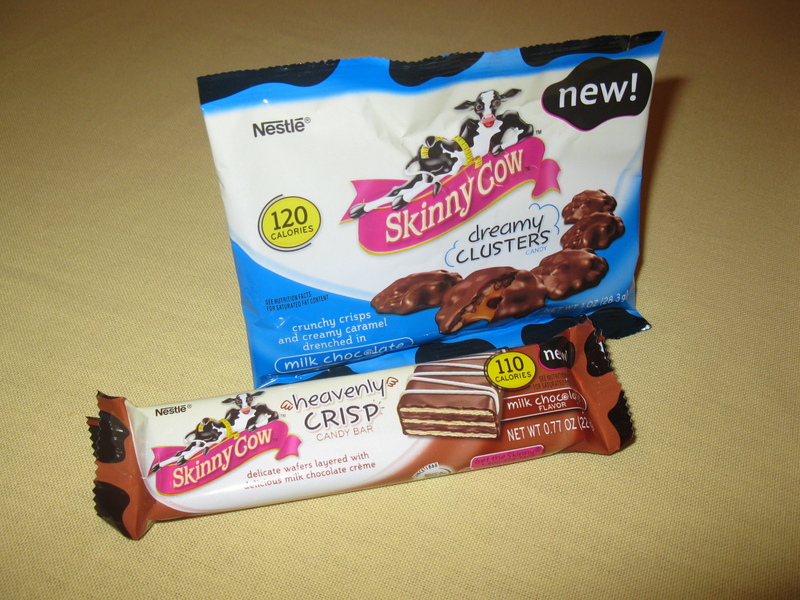 Today I tried the Skinny Cow Dreamy Clusters Candy, and Skinny Cow Heavenly Crisp Candy Bar. They are made by Nestle which knows a thing or two about chocolate. The Dreamy Clusters are made of caramel and crisp something covered in chocolate coating. At first they taste pretty good and have a good chew to them, but there is a slight salty aftertaste that is a bit off-putting. The Heavenly Crisp is a layered bar made up of wafers and chocolate. It is then covered in chocolate. I’d buy this one again. It was good. Both candies are only 2 Weight Watchers points per serving. The clusters have 3g of fiber per serving (maybe that’s the salty taste, or the mystery crisp something). All-in-all I think the skinny Cow makes pretty good diet products. Their ice cream sandwiches have always been superb. I think they’re off to a good start here. Keep ’em coming cow!